Your Treasure Trove for Rare Antique, Vintage, & Estate Jewelry! 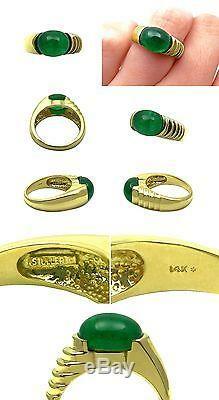 Vintage Designer "STULLER" Colombian Green Emerald Cabochon & 14k Solid Yellow Gold Statement Ring!! High Quality Collectible Natural Mined Green Emerald Gem!! Ring Can Be Worn By Men Or Women!! Size 6.25 (Please Inquire about Possible Resizing). The Focal Natural Mined Green Emerald Oval Shape Cabochon Measures Approx. 10.25mm by 8.50mm by 6mm in Depth, Weighs Approx. 4ct, Highly Desirable Deep Majestic Green Color with a hint of Neon Green, Excellent Luster & Sheen!!! There are some inclusions & matrices, but does not take away from the beauty of this Rare Gem. The Face of the Ring Measures Approx. = 7.25g Solid Gold & Green Emerald!!! RING COMES WITH GIFT BOX!! Up To 3 items can be combined for the flat rate of 1 item. Please Check Out My New Listings Daily!! We take credit in giving accurate descriptions and photos of all jewelry pieces in order to provide our customers with the most detailed information possible and to guarantee a good shopping experience online. The item "VINTAGE STULLER 4CT COLOMBIAN GREEN EMERALD 14K YELLOW GOLD STATEMENT MEN'S RING" is in sale since Thursday, January 21, 2016. This item is in the category "Jewelry & Watches\Vintage & Antique Jewelry\Fine\Retro, Vintage 1930s-1980s\Rings". The seller is "fierygems" and is located in Sunnyvale, Texas. This item can be shipped worldwide.